The Chrysanthemum Open day was a great success with over 110 people attending in the morning for the three talks, to buy plants and to study the display boards and cut flowers. More people arrived in the afternoon at the Hillside Centre. 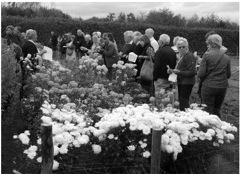 There was an additional optional visit after lunch to the trials them- selves at Deers Farm, where 75% of the cultivars on display were from Judy’s collection. Both Anne Godfrey and Bob Brown had a nursery display too.